In July, I attended the annual “Purple Martins 101” program at Cantigny Golf in Wheaton, conducted by Ray Feld, a devoted Cantigny volunteer. Feld monitors and maintains the busy purple martin colony that visitors see when they enter the grounds or when they play past on Hillside No. 6. The golf course entrance drive, in fact, features a Purple Martin Place street sign. There is perhaps no better address in DuPage County to observe dozens of the largest member of the swallow family. But martins are not the only swallows that enjoy some pampering at Cantigny Golf. Just down the way from Purple Martin Place is a new attraction called Barn Swallow Hollow. It was dedicated in June, in memory of a lady golfer who loved the game and the birds she could see while playing it. The barn swallow was one of her favorites. It’s easy to understand why. There is much to admire about barn swallows. 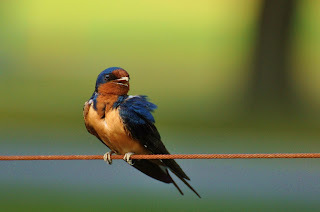 In the course of helping create the colorful interpretive panel for Barn Swallow Hollow, I learned a few things that made me like barn swallows even more. Of course I already knew about the bird’s agility and grace in the air. 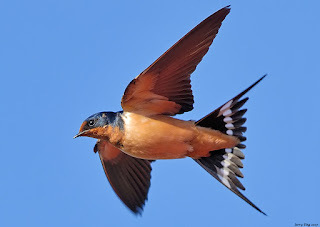 Barn swallows are fast, sleek and distinctive. Their deeply forked tails resemble streamers as they dart about, feeding on the wing. Flying insects are their fuel. All swallows are skilled flyers but I believe “barnies” win on style points. Golfers, these are the long-winged metallic-blue rockets that skim the fairway grass, sometimes passing within a few feet of your FootJoys. 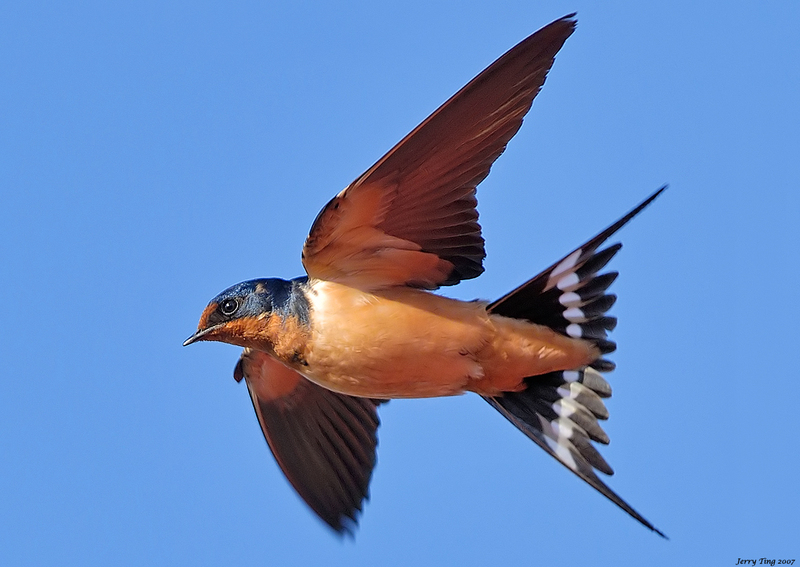 Barn swallows thrive at golf courses, sharing their playground with the paying customers. Unlike purple martins, the birds are not dependent upon man-made housing. They do, however, favor human-built structures for their signature cup-shaped mud nests, attaching them to walls or beams that offer protection from rain. At Barn Swallow Hollow, two bridges over a water channel provide ideal habitat. They are busy passages but the birds don’t mind. Fact is, they have a sweet situation thanks to Scott Witte, Cantigny Golf’s superintendent. Witte installed tiny platforms under the bridges to facilitate barn swallow nesting. And between the bridges he rigged a steel cable that functions as a perch for young birds and adults. Flight school can be exhausting! Witte knows that barn swallows would be fine without his intervention. The species is among the most widespread in the world, breeding on every continent except Antarctica. But if there is a way to make Cantigny Golf more bird and wildlife friendly, he’ll find it. Witte established a honey bee colony at the golf course, too. These projects—along with the purple martin program and a “bluebird trail” with 50 nest boxes—contribute toward Cantigny’s status as a Certified Audubon Cooperative Sanctuary, so designated by Audubon International. What I didn’t know about barn swallows until recently is that parents sometimes get a hand from other birds when feeding their babies. The helpers are usually siblings from previous clutches but unrelated juveniles may assist as well. 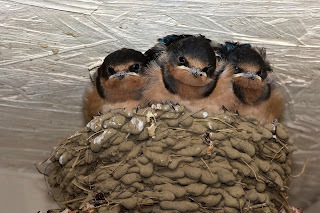 But here’s something else I learned, and it’s far from admirable: an unmated male barn swallow may kill the nestlings of another pair. His sinister actions often succeed in breaking up the pair, giving him the opportunity to mate with the female. There’s a lot going on under those bridges—the good, the bad and the ugly. Nature happens. ﻿﻿For the barn swallows, it won’t be happening around here for much longer. In August the birds begin their journey to wintering grounds in Central and South America. Since they depend exclusively upon airborne insects for food, they must depart our region earlier than most other migrating species. They travel in large groups, called kettles, and cover up to 600 miles a day. 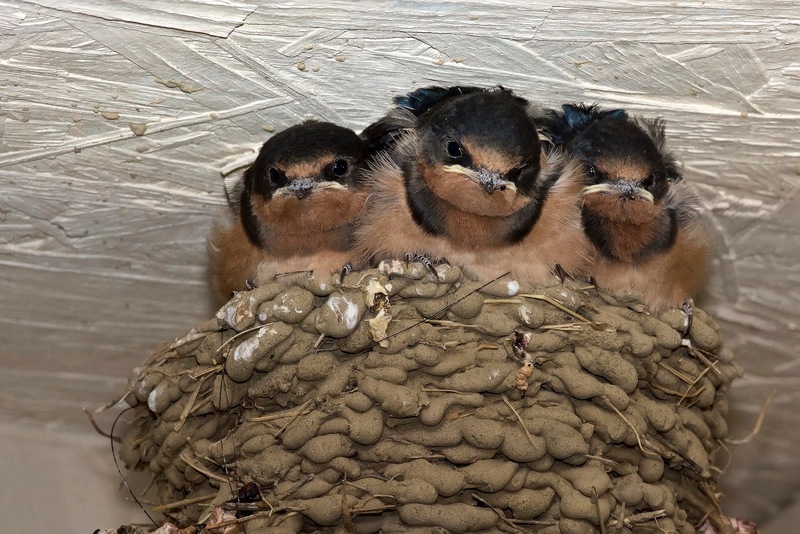 Some of the same birds that occupied Barn Swallow Hollow will return to Cantigny in 2016. We look for them in early April, about the same time the first purple martins and tree swallows arrive.